I was with a client this week and the conversation inevitably turned to the upcoming GDPR deadline. Straight away my client said “It will just be like the Y2K bug – millions spent on it for no reason”. Now for those of you reading born since 1985 apologies if you don’t know what the Y2K bug was. It has cost some firms an awful lot of money to go through the process. This is purely a personal one – in 1999 I was working from a desk with a window seat overlooking Sydney Harbour testing programs to see if they would still work come New Years Day 2000. Now I’m working in an office in Rawtenstall, Lancashire with a view of ASDA! 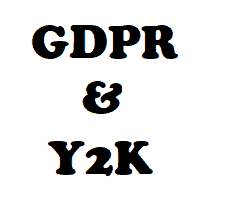 Only time will tell if the preparation work done for GDPR will be as damp a squib as that done for Y2K. So for those of you old enough to remember – what do you think?